Does your sorority have your heart? Nothing better represents your love for your sisters than with this beautiful Greek necklace with a cutout heart on a solid bar. 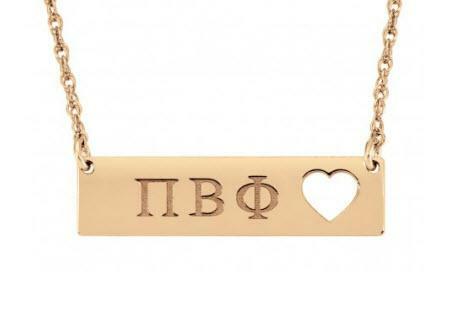 Makes hearts stop with a fresh heart cutout any your sorority name in a scripted font on this solid bar necklace. Available in sterling silver and gold, measures 1/4 inches by 1 3/16 inches, and rests perfectly on a 16 or 18 inch chain. If your sorority is not listed, then please indicate your sorority in the text block.